I have lived through two military coup d’etats here in Thailand. They were both very uniquely Thai style affairs. Normally we associate coups with violence, shooting, arrests, and political prisons, in other words very unpleasant events. However Thailand has come up with what I call “velvet coups”. I remember the first one in 2006. The army rolled out tanks in the streets of Bangkok. 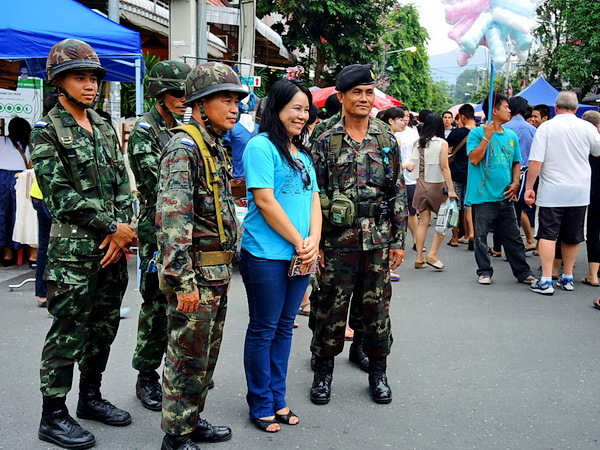 But instead of creating an atmosphere of terror among the citizens, many Thais took it as a fun event. They climbed up on the tanks, handed flowers to the soldiers and had their pictures taken while posing on the tanks with the soldiers. No shots were fired and nobody got hurt. Now in 2014 there was another coup by the army. This one was even more “velvet”. No tanks were out this time, again no shots were fired and nobody got hurt. Most of the Thais seemed to appreciate the coup since it had stopped the constant political unrest and violence which had gripped Bangkok for years. People came out and handed the soldiers food and drinks. There was remarkable restraint by the army even in the face of small demonstrations which violated martial law. Although there were detentions of people who were seen as possible activists, nobody ended up in a prison cell. All were treated well and had decent accommodation, and all were released within a week or even a few days after signing a statement that they would not engage in any activism. The army leadership went way out of their way to not antagonize the people. 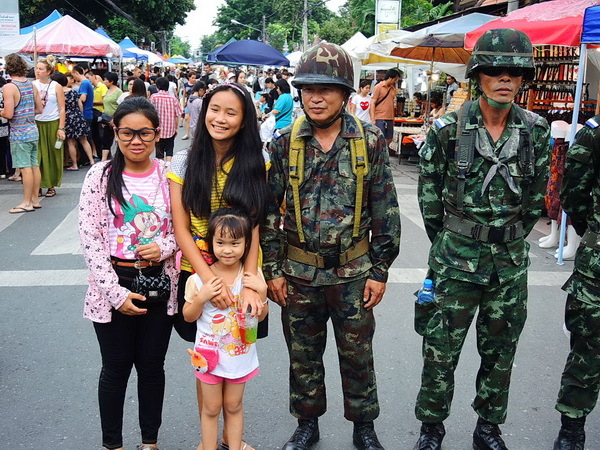 For example the army put on free concerts in Bangkok and even provided free hair cuts to the citizens. They also immediately started to pay tens of thousands of rice farmers who had been left unpaid for 8 months in a subsidy scheme by the previous government which had turned into a disaster. I am not trying to pass any judgment about the coup’s political justification, if it was right or wrong, necessary or not. All I can say is that the Thai army managed to pull off this coup in a very restrained way. I mean if there has to be a coup, then the Thai style “velvet” coup is the way to do it. From my personal experience, I feel safer now than before. For months and even years there was an increasing polarization in Thai society with often violent protests. Clearly the democracy was not working very well. All in the name of democracy dozens of people were killed and many hundreds were injured in the political wrangling in Bangkok just in the last 6 months. If that’s what it means to have democracy in Thailand, then I can do without it, at least for the time being until they get a little better understanding of this democracy thing. Unfortunately the international media portrayed the coup as a sinister and dangerous affair, and many countries issued travel warnings for Thailand. The funny thing is that most tourists in Thailand never even noticed that there had been a coup, except for a temporary curfew at night. I have no political affiliation here in Thailand and I don’t pretend to understand what’s going on behind the scenes. However as far as coup d’etats go, the Thai style “velvet” coups are as good as it gets. So far the Thais that I have been talking to seem to appreciate the coup and they seem to think that Thailand is better off with it than with the derailed previous democratic system. Of course not everyone will agree with me, including some Thais. There are heated opinions on both sides. I am not at all interested in engaging in political discussions. All I am trying to do is paint a different picture of the state of affairs here in Thailand as someone who actually lives here than what is written in the western media. Thailand is not chafing under the yoke of an oppressive military junta, people are not deprived of all their freedoms, and life pretty much goes on as usual, minus all the conflicts and violence that happened before the coup. The majority of Thais seem to appreciate the coup as a necessary step to get the country back on track to a democratic system that actually works. Let’s hope that this is the way how it will work out. Thanks for another well-written piece with good insight.I always find it fascinating how unique Thailand is. How paradoxical and just “different” in so many interesting ways. And most aspects of “Thai-ness” will certainly challenge anyone who tries to evaluate and pass judgement without having first-hand experience and “feel” for the culture. Short of being there, your writings are the next best thing to having the real picture. Thanks Deon, you are right. The problem comes in when people try to understand Thailand through western eyes, and it just doesn’t work. You can’t just superimpose American democracy upon Thailand. Americans will never really understand how a coup can actually be good for people, or at least that it can be the best solution available in the absence of a democratic system which is actually working. Lots of people here are quite happy with the new military government and the steps they have taken to address many problems here in Thailand. I am glad to hear all the good news from you. I can totally understand how the Canadians love your wonderful Thai wife. You are a lucky man. I am looking forward to finally meeting you when you come back to Thailand. The road to democracy is never easy. We in the west can easily overlook our own traumatic histories of how democracy was established. And there are countless other countries where a colonial power gives a country its own democratic control only to find it destroyed or completely corrupted within a few years. After a huge military effort the situation in Iraq seems to be little better than the days of Sadam. So the western concept of “install a democracy and all will be well” is naive. It does not work like that. I think that Thailand could be an interesting study of a country proceeding in a positive direction without incredible trauma. One also needs to realize that its near impossible to really understand the complexities of another country. In this context interference or intervention is seldom effective in producing long term benefits for another country. Very true Graham. Libya is another example where the imposition of western style democracy didn’t work out very well and they seem to be worse off than before they got rid of Gaddafi. It would be totally naive and ineffective to try to have American style democracy here in Thailand right away. So far the country seems to be much better off with the present military government. It’s the first time in many years that constant fighting has stopped and that a government can make effective decisions without having to go through a corrupt or ineffective so called democratic system.